After leaving Belize City you will travel a short distance (about 30 minutes) to Rainforest Adventure Zone. Once at the zone, there is a crocodile enclosure featuring many Morelet’s crocodiles and turtles. 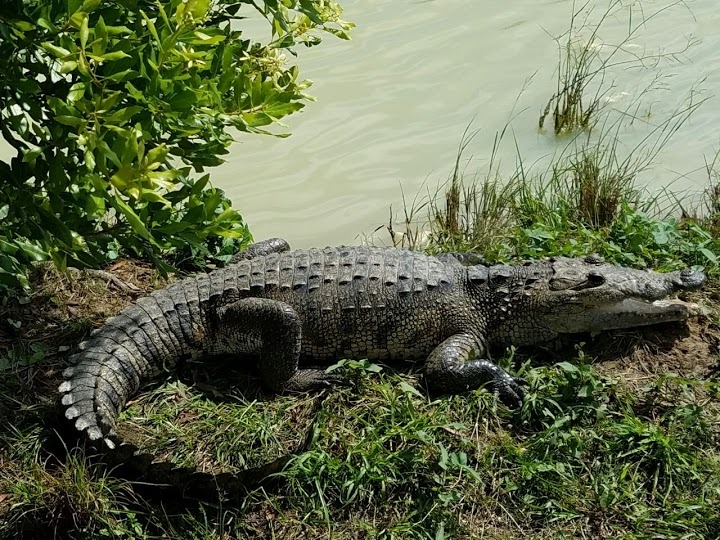 These crocs have been brought to the Zone by the American Crocodile Education Sanctuary who are committed to the conservation of this protected species. Great opportunity for pictures and you may even get a chance to feed them if you’re there at the right time. After the croc encounter, it is time for ZipRiding through the jungles of Belize. The zip-line tour features an intricate harness system of pulleys on horizontal traverse cables which lets you glide 100 – 450 feet between platforms up to 75 feet high in the trees at canopy level. After being fitted into the safety harness, the next 30 – 50 minutes are spent zipping through a series of zip line runs from 7 jungle platforms. 4 lines crisscross the river from bank to bank and the red air bridge between platforms 4 and 5 is perfect for a selfie – a truly unforgettable experience! All guests must fit into the safety harness to participate. The maximum waist limit the harness will allow is 46 inches. Closed footwear must be worn. Tennis or hiking shoes are recommended. Welcome, to Belize Rainforest Adventure Zone, pioneer, and market leader with over 40 years of experience in active adventure within the tiny & bio diverse country of Belize!